L'ho incollato su un cartoncino di recupero per dargli un maggior spessore, senza aggiungere altro. Per l'albero ho usato la fustella Couture Creation- Secret Garden Collection- Large Winter Tree e ho embossato il tronco, prima con l'embossing folder Textured Impression Woodgrain#3 e poi a caldo con una polvere da embossing color rame, per evidenziare la texture. Li ho incollati con una colla a penna; mi sono aiutata con uno stecchino, che ho premuto su un pezzetto di biadesivo per renderlo un po' appiccicoso, in modo da poter agevolmente prendere i fiorellini più piccoli e attaccarli in posizione. 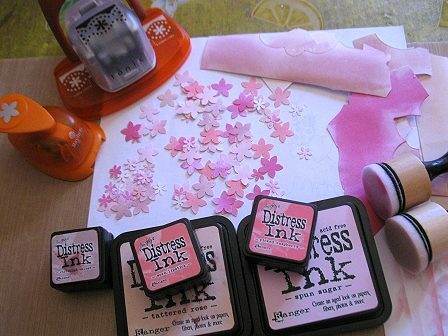 Il bordo color rosa antico, in basso, è uno dei miei coperchi delle teglie di alluminio tagliato con una fustella Sizzix Thinlits e colorato con gli alcohol inks. In foto purtroppo non si vede bene il luccichio metallico. L'uccellino sul ricciolo nell'angolo è tagliato con una fustella Crafty Individuals (Victoria Corner), colorato con i Distress Inks. 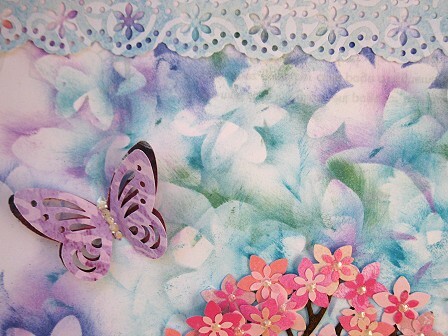 Le farfalle sono tagliate con un grande punch, in due strati, da avanzi di carta scrap. Il bordo in alto è tagliato da un avanzo di carta scrap, con lo stesso punch che mi è servito per fare i fiorellini piccoli. this is a wonderful and super design card. Love all the wonderful colour choices, and the super deaign. This is beautiful, such a pretty background and gorgeous tree. Congratulations on your GD spot. Beautiful card Alice and I just knew there were lots of punches used on it. Thank you for being my Guest Designer for this challenge. Hugs Mrs A. Love what you've made for your GD spot! First, that own made paper wow. Second, the texture of the tree looks fantastic. 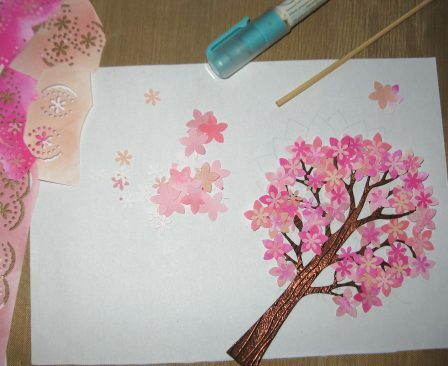 And what a patience you've got making all those tiny flowers for the tree, but it's so worth it! The border made of a can makes a super ground. It's a gorgeous card!! Congrats on your GDT spot - and what a way to show off that challenge with another fabulous card! I LOVE the background with the beautiful colors and subtle flowers. Put a punch, paper, and inkpad in your hands and you make gorgeous things happen! This is simply stunning! WOW!! Hello, Alice! All I can say is... STUNNING! First of all, congratulations on your win and on your Guest Feature over at Mrs. A's challenge! You certainly made a beautiful card for this theme! This is absolutely gorgeous! I love how you detailed each step that went into making it. 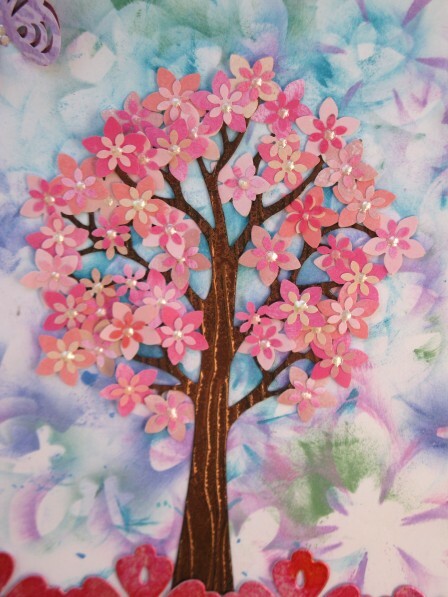 I LOVE the idea of using the woodgrain embossing for the tree - I will be using this tip the next time I use a tree (I hope I remember!) - and the bronze - it really looks like a tree trunk! 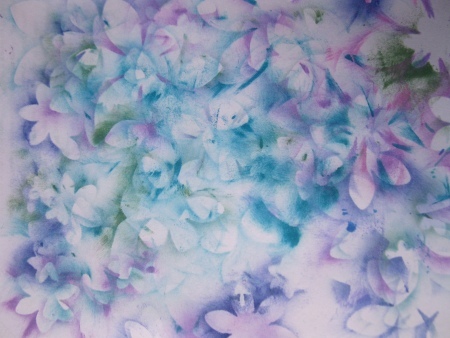 I am also very impressed with your background, which you recycled from your ink blending - brilliant! And so pretty! And then you painstakingly inked, punched, and adhered all of the tiny flowers - so well worth your time and effort - the tree puts on a show! The butterflies are so pretty and are perfect for this scene! Amazing card, my friend! Very beautiful. Love the colours and all the details. Congratulations on your GDT spot, well deserved. Absolutely beautiful Alice. LOVE the tree!! 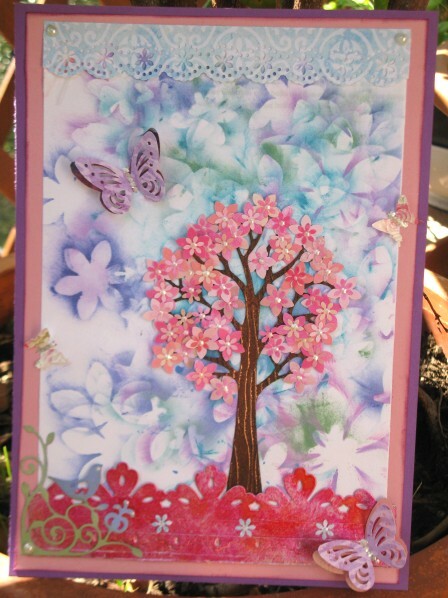 I did one similar a couple of years back using punched flowers but yours is way more lovely than mine! And of course it's fine for Aurora to have her own entry - you made that clear in the blog post with her Brushos work so she will also be in the prize draw as well as you. This card is just breath-takingly beautiful! So lovely! 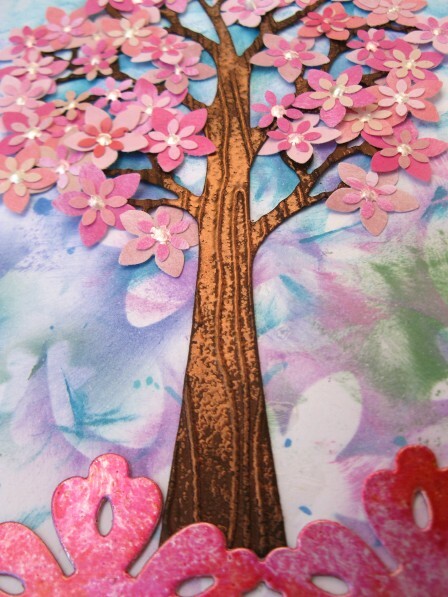 Such a pretty card and certainly lots of punching to achieve that beautiful tree. Fantastica, quanti dettagli! L'albero è spettacolare, lo sfondo, una casualità venuta bene bene bene, bellissimo l'effetto dei fiori sovrapposti in toni diversi! 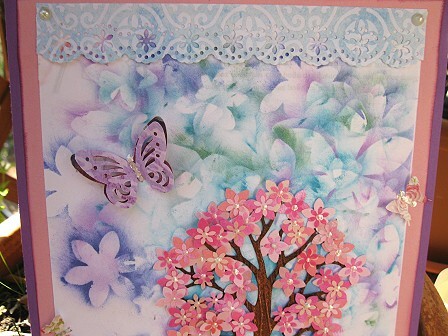 this is stunning card, the background is incredible and the three - such a lovely design! thank you for all your tips and congratulations on the GD! Wow, wonderful card. I enjoyed seeing how you made all the different elements. 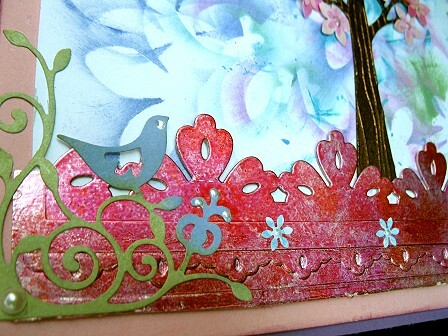 Such patience and brilliant to use up the scrap for the background and foil for the border. It is all very pretty. What a pretty creation, Alice. The colours are absolutely delightful and your background technique is simply amazing. 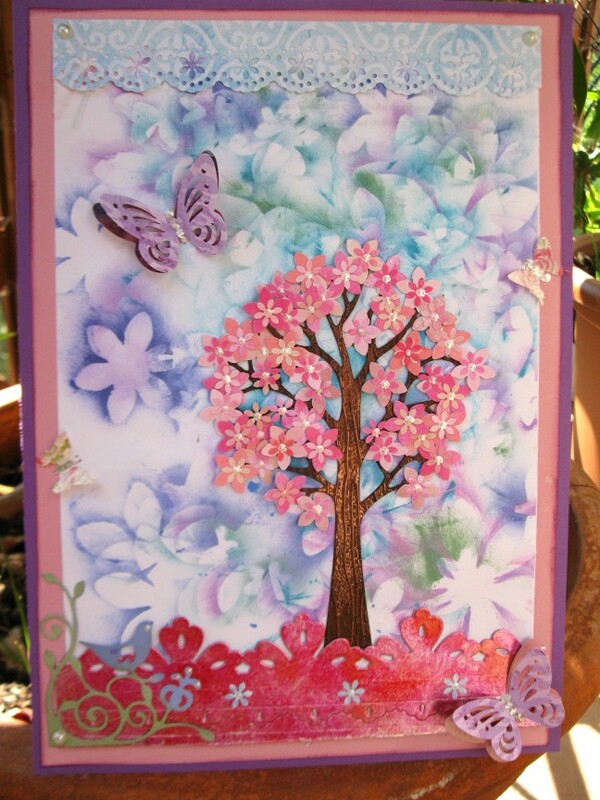 The tree is the star of this project and I am in awe of all the lovely flowers and butterflies you made. A true labour of love. Mi piace tantissimo. Quanti spunti grazie.